It’s 10:54 on back-to-work Monday… back to work for everyone at my office except me. I’m still in my PJs eating a delicious apple. Mat leave is strange. It was hard for me to walk away from the job I’ve moulded over the last ten years. And while I’m excited about the year ahead, it’s still weird to think that someone else is in my office right now, sitting in my chair, typing away at my computer… it’s amazing how territorial I can be especially considering this job was just supposed to pay the bills while I was in school. I graduated five years ago. I made the most delicious lemon and ginger elixir, and followed it up with a “Peep in My Step” juice (recipe below). I did my exercises and stretches. And enjoyed a few minutes of silence. I had a super healthy breakfast, and took every possible staircase I could to work. 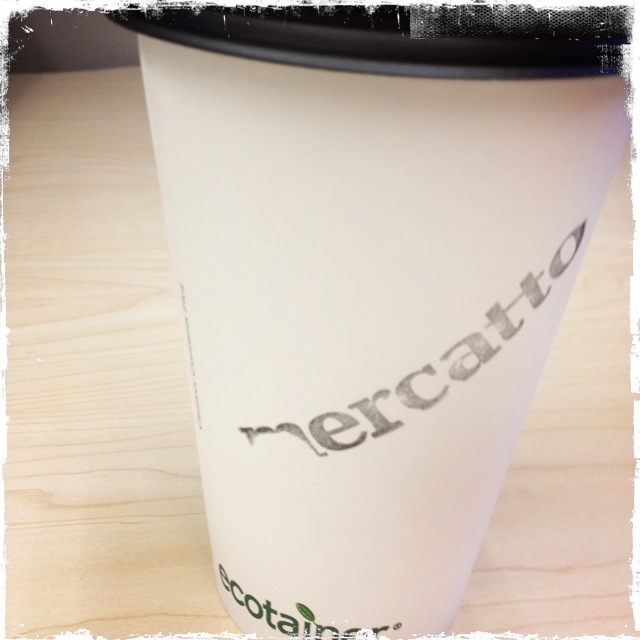 Americano from Mercatto, made by Alice. Joy. Last night I stumbled upon Robin Sharma’s 62 Tips to Get Unstuck in 2013 and absolutely loved it. Do a nature walk at least once a week. It’s renew you (you can’t inspire others if you’re depleted yourself). Know your “Big 5″–the 5 goals you absolutely must achieve by December 31 to make this year your best yet. Hope you can find something that inspires you this morning. P.S. 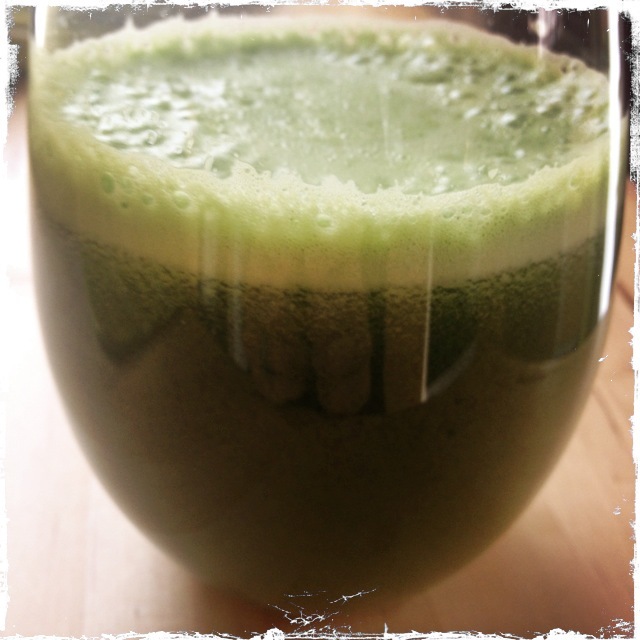 My “Peep in My Step” juice involved apples, kale, celery, swiss chard, and lots of ginger. Yum! Today has been the most lovely of lovely Sundays. I woke up early, refreshed. I called my grandma in Poland. I love grandmas. I drank coffee and read magazines, and lazily got ready for my day. Hubby and I went errand-running, which I really, really enjoy. We got everything done super duper quickly. And then stunk in a round of golf practice at the Golf Dome. I kept to my 2013 commitment to drive one way wherever we go (more on this one day soon). Then I made soup, and the most glorious lunch for tomorrow, and read some more. Then a light dinner, maybe a movie, a bath and an early night. Joy, joy, and more joy. Today I made a version of my mom’s Sweet Potato Carrot Soup. Yum, yum. Two big sweet potatoes, peeled and diced. Four large carrots, diced (peeled if not organic). About 1 litre of stock or water (enough to cover the veggies). 1 inch piece of ginger, crushed. 1-2 cloves of garlic, crushed. 1/2 can of coconut milk (optional, I just happened to have an open can in the fridge). Garnish: oranges and/ or cilantro. Dice up the veggies and throw them in a big pot. Cover them in water/ stock and add a pinch of salt. Bring everything to a boil then cover and simmer until the veggies are tender. When tender, toss in the garlic, curry, tahini and coconut milk, and any additional salt. And really, you can completely ignore my measurements – just add things in until it tastes perfect to you. Says the tamed fox to the little prince in The Little Prince. 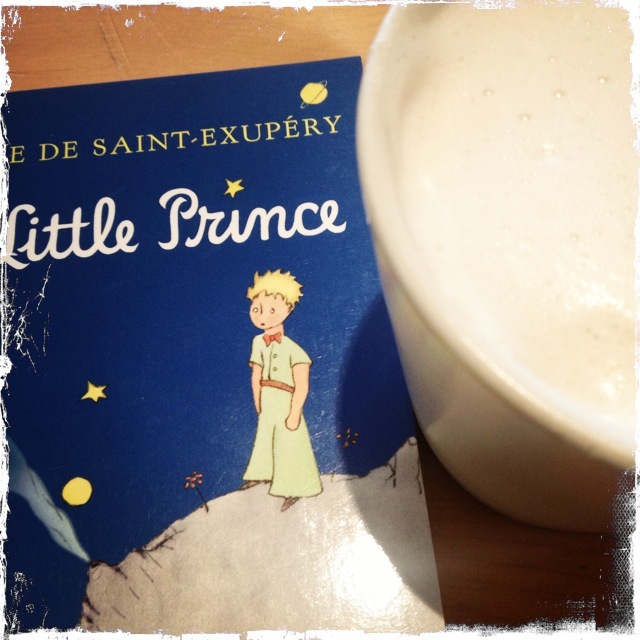 The Little Prince and a delicious almond mylk latte. Joy! Hope you’re having a joyous Sunday! Today is day four of my juice fest. 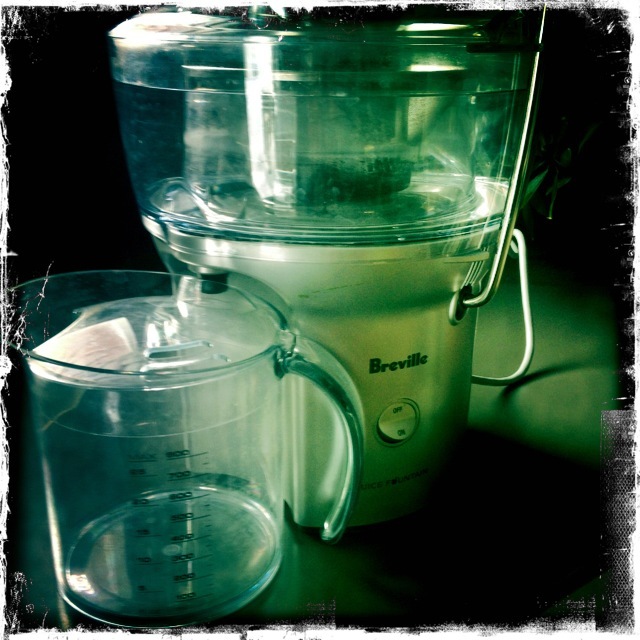 My amazing husband got me an amazing new juicer, replacing Old Faithful, without me even having to ask for it! I love him so. For the past few days, I have been adding one big, huge green juice into my daily diet, usually right after my morning lemon water. The juice is simply my healthy treat for my cells. No drama. No cleanses. Just pure juice love. Half of a cucumber (peeled as it wasn’t organic). 1 inch piece of ginger. Lemon juice to squeeze on top when it’s all done. This past month has been wonderful. Really, truly wonderful. I feel like I’ve really hit my stride. It all really boils down to a few ideas I’ve allowed to percolate in my mind. But it’s one you need to make constantly. And that the universe has your back. It does. When all of the above fails, remember that there are always extraordinary things happening. 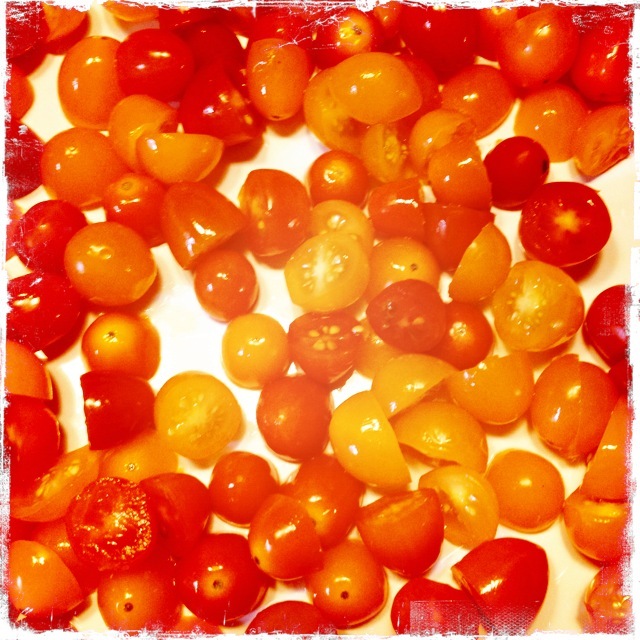 Oh, and this weekend I made these: roasted tomatoes and roasted strawberries! So yum! One big carton of strawberries. Preheat oven to 350f. Trim strawberries and cut them in half. Place them in a baking dish (not a baking sheet as the juices will drip all over your stove… messy!) 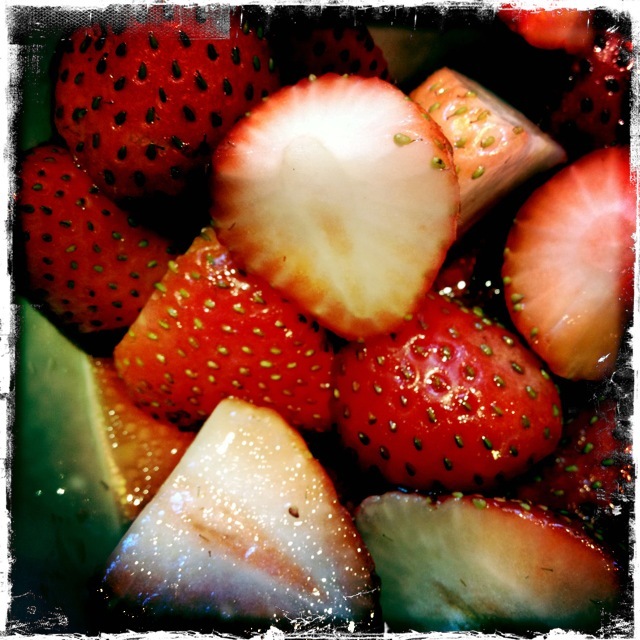 Mix all other ingredients in a bowl and pour over strawberries. Give the berries a swirl so that they are equally covered in liquid. Bake for 30-40 mins. Let cool and enjoy alone, over yogurt, with granola, in a salad… YUM! 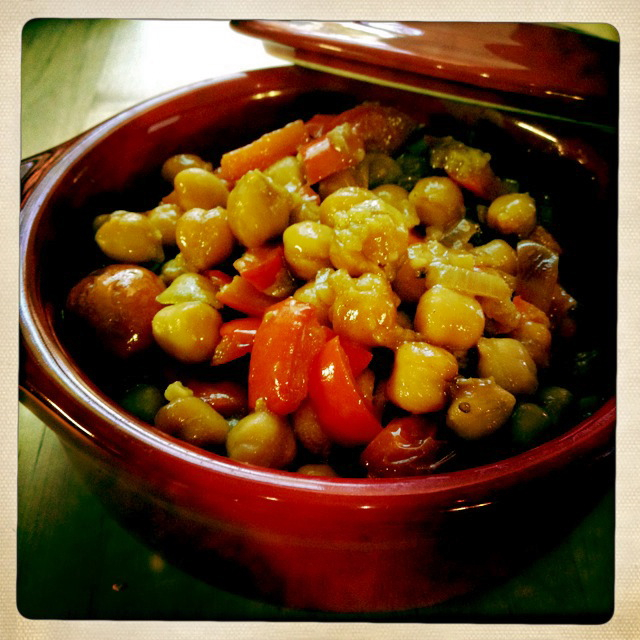 At the same time, you can also make Roasted Tomatoes! One big carton of cherry tomatoes. 1 tbsp white wine or white balsamic vinegar. Preheat oven to 350f. Cut tomatoes in half. Place them in a baking dish (not a baking sheet as the juices will drip all over your stove… messy!) Mix all other ingredients in a bowl and pour over tomatoes. Give the tomatoes a swirl so that they are equally covered in liquid. 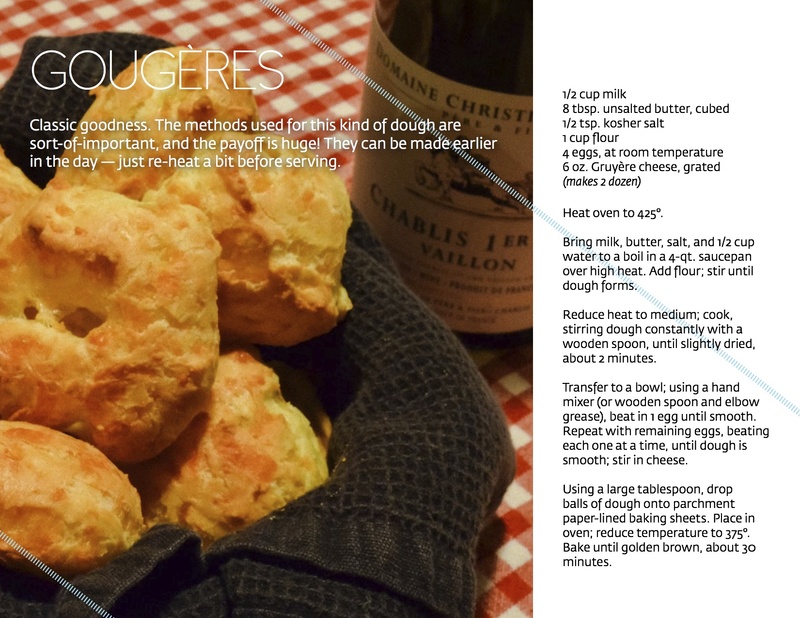 Bake for 30-40 mins. Enjoy! Finally, please send some love to my friends, Mark and Lynne, and help Mark heal. This long weekend could not have been more perfect in Toronto. 25-30c and pure sunshine each and every day. Wow. Today I hopped on my bike and met my mom some 20km away in a beautiful, beautiful park by the lake. It was my second bike ride of the year so needless to say, I was a little zonked when I got home… zonked and hungry! I popped open the fridge looking for something light and fresh and very, very delicious. 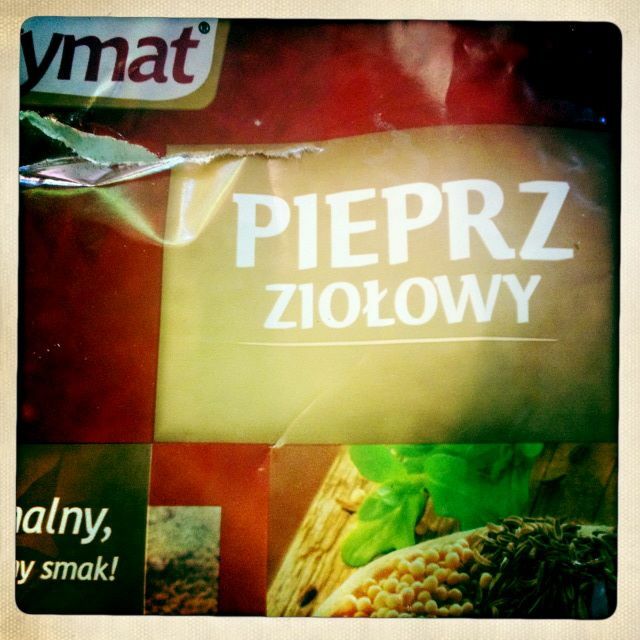 Somehow I ended up with my grandma’s cucumber salad (“mizeria” in Polish) but with a happy healthy yogi twist. The name of the salad translates to “misery”… but it’s anything but miserable. It’s delightful. Juice from half of a juicy lemon. Typically this salad is made with sour cream but the greek yogurt provides a super healthy alternative packed with protein and healthy bacteria your gut will love. Also, forgo the traditional white vinegar for some healthy lemon juice or apple cigar vinegar. A perfect summer salad!